Finally, the answer is: Yes! Suddenly, it’s a great time for book lovers and serial browsers in downtown New Rochelle. First the Barnes & Noble operated with Monroe College opened in New Roc City, offering current titles and classics, their pages still giving off that new book smell. And now this. A permanent home for the book sales run by the Friends group. The wares are no longer grouped in cardboard boxes on tables out in the open, where they must be covered when not in use. Now they stand on shelves and rest in wooden carts in their own dedicated, more compact space. For now, the bookstore will be open the same hours as the sales – Tuesdays, Thursdays and Saturdays from 10 a.m. to 3 p.m., with larger sales planned one weekend each month. But Amy Tietz, President of the Friends group, says they hope to add hours, depending on how many volunteers they have. Ellen Morrell, a patron of the library, was one of the frequent book sale customers who stopped by to affirm the good news that the store was up and running. “It provides a wonderful opportunity to recycle reading material into the hands of people who otherwise might not have it,” she said. 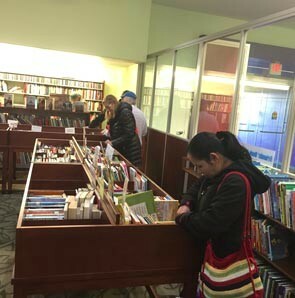 The “honor box” and “honor carts” will remain outside the store, available anytime the library is open, for you to pick up mysteries, one-time best sellers and other volumes for as little as 25 cents, Tietz said. As the name suggests, payment is on the honor system. The store will operate with regular hours selling books from 50 cents up, both well-worn volumes waiting for a new owner to discover their treasures, and those once owned by reverent readers who barely bent the covers. Shelves are filled with popular books and general fiction, while other works are divided into categories – science fiction, health, children’s activity books, graphic novels, books in foreign languages and on and on. One section holds books signed by the authors. Look for CDs in the top levels of the shelves. And what you see there is just the tip of the iceberg. The Friends organization stocks some 30,000 books in the library basement to replenish the shelves, Tietz said. A wood-and-glass case in the store holds more valuable items, including vintage editions of Nancy Drew and Hardy Boys adventures, an old edition of Heidi with a cardboard book sleeve, among others. You never know what might come in. The Friends once sold a book signed by Ray Manzarek, keyboardist for The Doors. (Google it, kids.) Another find was a little-known book by J.M. Barrie of “Peter Pan” fame, signed by the author. Among books recently spotted behind glass were painter Norman Rockwell’s one work of fiction, “Willie Was Different,” signed by Rockwell and his wife Molly; and a book about the Neville Brothers signed by all four of the musical siblings. One of the best finds currently on display is an early edition of the two-volume “Personal Memoirs of Ulysses S. Grant”. Released after the Civil War general and 18th U.S. president died in 1885, the memoirs were among the first books published by the Charles L. Webster & Company, a firm begun by Mark Twain. Popular when they were first published, the memoirs are still in print and well-regarded. The funds from the sales support activities at the library, which is more than just a place for books and DVDs – it’s a showcase for art and a gathering place for performances, classes and other programs. By the way, the group says they can never have too many Friends. They always have room for more volunteers to help sort, price and cart the 1,000 books they receive each week.